Bad - Nextion NX8048T070 - Generic 7.0 HMI TFT LCD Touch Display by ITEAD Intelligent Systems Co.Ltd. My intention was to build a cool speedometer for my Kawasaki Ninja ZX9-R. Started up this project by collecting information. Since Im a noob to hardware hacking it took a while do decide what components to use. I decided to go for a Arduino MEGA 2560 as a brain and Nextion NX8048T070 as HMI. The Arduino was no problem to get my hands on. I bout it at a local electronic store. Placed my order on April 1, 2018. Paid $24 extra for fast shipping with DHL a total of $111.30 + tax. And by the 4 of April the package arrived. I was like a child on his birth day, super happy and exited. Unpacked the display and I immediately noticed that something was wrong. The loose breadboard for USB/Power had bent pins. And then I saw that the anti static bag was scuffed. I also noticed a small black thing, of what I initially thought was a piece of plastic. But when i looked closer it was a small electric component. Not so happy and exited anymore. - "We will be closed during Chinese New Year holiday from Jan 11th to Feb 22th." Ok, so they maybe forgot to change the date. I waited for three days and got a new answer on my ticket 2018-04-07. - "We have move our Nextion business to nextion.itead.cc Please feel free to join our community on the new website. 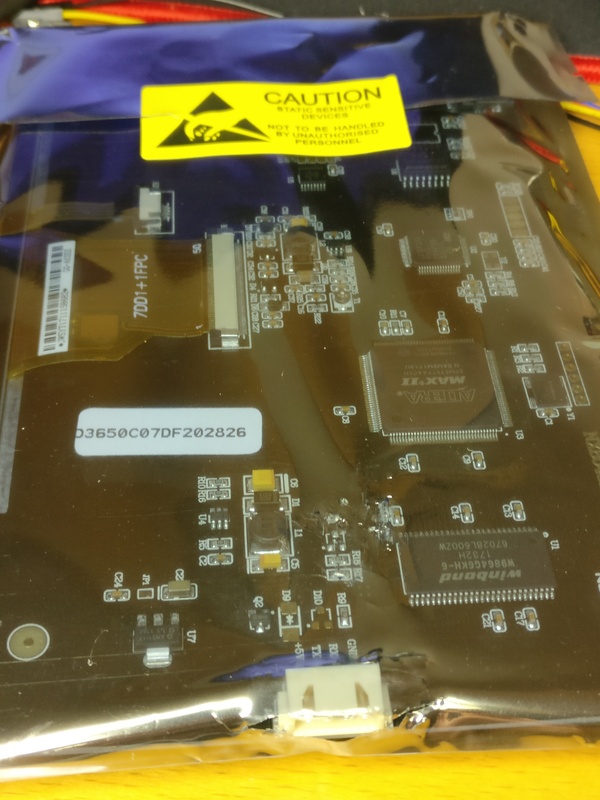 Standard support for Nextion device: https://nextion.itead.cc/support/l1-support-system-2/"
I received my package today, and found that pins on the connection board was bended. The box did not have any visual damage. have not yet opened the electro static bag, but it looks like the screen had a ruff ride sins there are several scratches on the bag. No response received from customer. Ticket closed. This is interesting! It's ok for Itead to wait three days to answer, but I can't even get one and a half day. Created a new ticket and posted the information they requested. They replied that my ticket was investigated and handled in the first, closed, ticket. There is no real way for this to occur, we find fault with the credibility of your presented story. The part with the bent pins is not even a Nextion part and does not belong to the Nextion. The adapter pins not at 180° is not an issue. The damage to the static bag requires deliberate force. This is not even possible from a delivery especially where the box even has no damage. The double internal QA of Itead would prevent. The strict shipping rules inside China requires open package before acceptance of delivery, such a carrier would automatically refuse to accept responsibility for an already damaged product. The box is never even sealed before customs inspection to ensure declared value and declarations are valid, and all parties have signed off. It is unreasonable that such damage would go unnoticed. The spart part not from Nextion would indeed not be permitted at customs. If this package was opened at your counties boarder as per your laws, perhaps the bag may be damaged, but it is not foreseeable they would add an extra part for the sake of it. - the spart is not from Nextion - you can open the static bag which already looks like the seal has been cut 1" on the left side of the Warning label. - The USB adapter pins can be bent back without isuse. There is nothing more to debate. Ticket closed. Maybe they got it all wrong? I'll try to explain in a different way. Please, I think you have misunderstood! Sorry for my bad explaining, so lets make a new try. No the adapter pins is not an issue, is't the part that caused it all. And by looking at the pictures you can see that the breadboard for power has scuffed on the bag! So this is a shipping damage that has arisen from bad packaged components. If I am wrong please send me a picture of the same area were I made the circle that shows the empty soldering points. 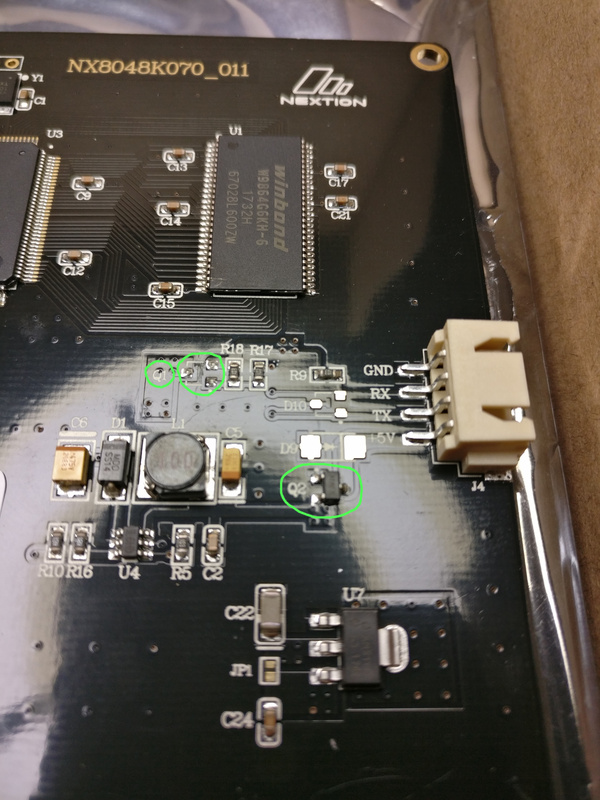 You sad "The part with the bent pins is not even a Nextion part and does not belong to the Nextion" how come my display have one mounted close to the part where the empty soldering points are? 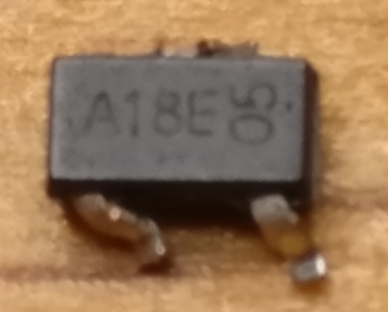 It's a a18e transistor. Q2 is the same component that the loose one in my box. And the empty soldering points is called Q1. It may be a coincidence. It seams like my other support ticket is closed and ignored so I send a new one with reference to the old one ED0728732621. 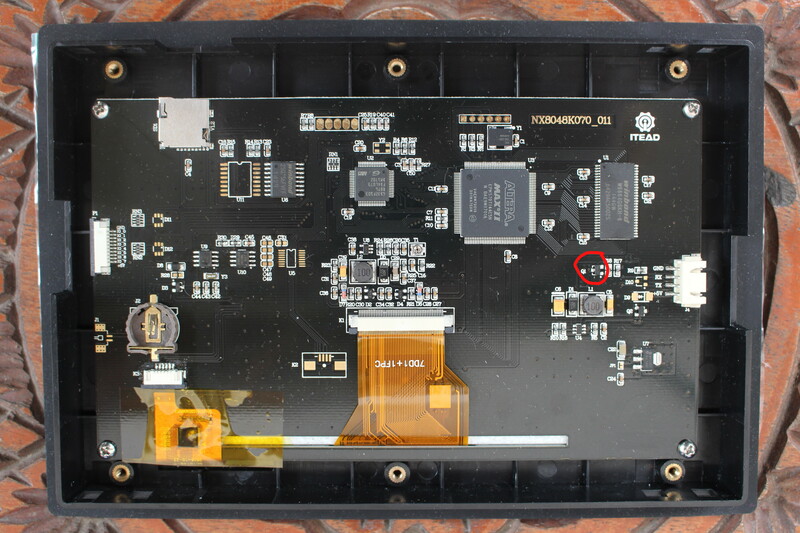 I found another board on the net with a transistor mounted on that point where mine only has empty solider points. As mentioned by support earlier: "There is no real way for this to occur, we find fault with the credibility of your presented story"
Ok, so now its time fore me to question your credibility!! Support wrote this: "- the spart is not from Nextion"
I have proved that the loose part is from my screen, see this picture and all the other pictures mentioned in my original ticket ED0728732621. 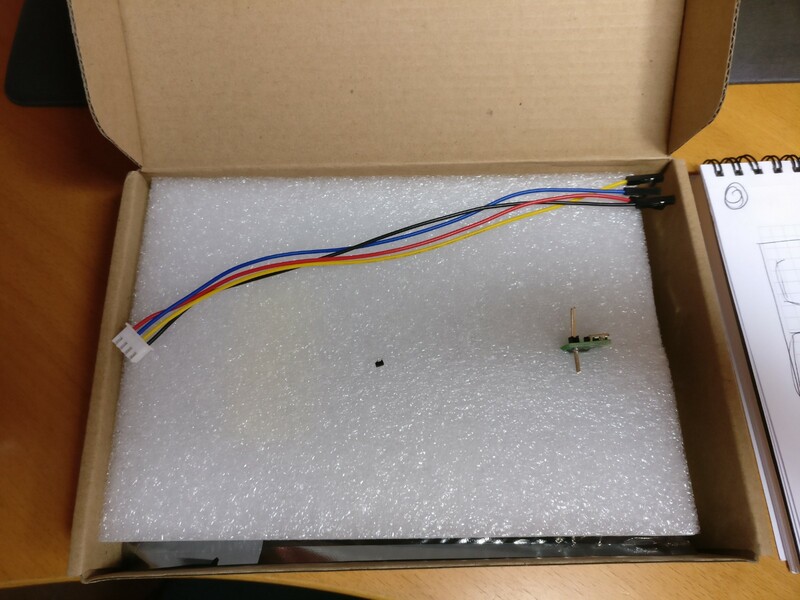 An image I found on internet where the component is mounted! And wow!!!! I got a answer! We found credibility issue with your original story/evidence and rejected. We find even more credibity issues with your second story. We believe with your second set of photos you have now provided sufficient evidence now to prove deliberate fraud. Your persistence lends further to a deliberate and meditated effort to defraud. We have originally chosen to let slide as a matter of all is less effort - we now reserve the right to change our mind given as we have the evidence you presented preserved. Sorry, the issue is closed and this ticket will also be ignored. I think that if you want a display don't by it from ITEAD! Why would I make up a story of a broken display? All I wan't is a new cool speedometer for my Ninja, but now the motivation kind of disappeared. This don't get me a functional screen. But it feels good to warn you all so you don't make the same misstake as I did. Can't say it enough, don't by anything from ITEAD if you want things that work or have nice and helpful support! If you have some thing you wan't to share or ask, or if you had a similar experience, please send a mail and tell me your story.